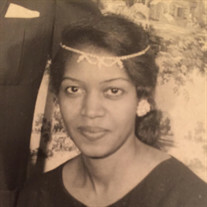 EVELYN EUGENE LINSON (nee Moton) the beloved wife of the late Willie B. Linson, and dear mother of Valerie Linson of Belmont, MA, Jacqueline Linson of Chicago, IL and Willie B. Linson, II (Kimberly) of Twinsburg, OH; dear grandmother of Willie B. Linson, III, Kamiya Brielle Linson and Niles Bradford Linson. The family prefers that those who wish may make contributions in her name to The Hospice of the Western Reserve, 300 E. 185th St., Cleveland, OH 44119. Family Services will be held in Lake View Cemetery. Evelyn was the second oldest of seven children and the last surviving sibling. She was born in 1932 in Greenville County, South Carolina. Her father was a sharecropper who moved his family north for a better life to the Cleveland area when she was a little girl. Possessed of a strong work ethic, she began working as a teen-ager as a babysitter for several families in the Cleveland area and as a seamstress' assistant; she later worked as an assistant in a lawyers office. Her earnings (together with those of her older sister) helped her parents purchase the family home in the Hough area of Cleveland. After she met and married Willie (Rocky) Linson, Evelyn settled into the life of a stay-at-home mother, and with her husband, raised three children: Valerie, Jacqueline, and Willie. When her children were older, Evelyn stepped back into the professional realm as a supervisor at the Omni Hotel (now InterContinental) restaurant in the 1980's until she retired in the late 1990's. Evelyn was a devoted wife, becoming the primary caretaker at home for her husband during his illness and until he preceded her in death in 2013. A great source of joy later in life were her grandchildren: Will III, Kamiya, and Niles. Any visit from the children or mention of their name resulted in the biggest smile. Evelyn's faith in God was unwavering and the source of her strength, wisdom, humor, compassion, and generosity. Evelyn passed into God's kingdom peacefully on New Year's Day 2018, with her beloved children at her side.